“Salvation is not achieved through a general principle or rule; it is achieved through the very particularity of the Son in whom all humanity is saved.” – Tom Greggs (Lecturer in Christian Theology, University of Chester). This book explores the dynamics of the Spirit and Son in the economy of salvation. It offers an interpretation of Barth and Origen around this theme, bringing them into a formative dialogue for a constructive theology of universal salvation. 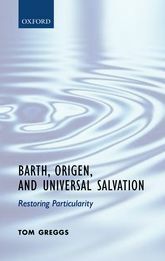 Examining Barth’s doctrine of election and Origen’s understanding of apokatastasis, the book proposes that a proper understanding of the eternal salvific plan of God in the person of Jesus Christ points towards universal salvation. However, salvation is not achieved through a general principle or rule; it is achieved through the very particularity of the Son in whom all humanity is saved. Further place for human particularity is established through the economy of the Spirit. Origen and Barth’s economic pneumatologies indicate the reverse dynamic to that of their interpretation of the Son’s economy: while the particularity of the Son has universal effects for all particulars, the universality of the Spirit particularizes that universal in individuals and communities in the present. However, this is in a manner which avoids a binary separation of Christians (as the saved) from all other humans (as the damned); instead, Christians are led into the ever greater depths of God, in a manner which allows God’s Spirit to be present in diverse ways with humans and human communities in their temporal particularities. This dynamic of Spirit and Son in salvation allows for the place of faith, ongoing history, and community within a soteriological schema which offers a universal hope of salvation in Christ.